San Marcos senior Lyndsay Pearson will compete in the Channel League Finals at Dos Pueblos High. Fifty years after it opened its doors, San Marcos High is laden with achievements, and this week is a perfect time to review some of them. • Academics: Athletic director Abe Jahadhmy reports that San Marcos surpassed all other Southern California schools in its enrollment division (1,500 plus) with 21 of 22 sports reporting grade-point averages of 3.2 or higher. The Royals had 11 teams in the CIF’s top three, led by a pair of number-ones: boys’ water polo (3.713) and track and field (3.578). • Volleyball: It’s the end of an era tonight, May 1, when the boys’ volleyball team plays its final regular season home match under retiring coach Jon Lee. Among the players Lee has coached in the past 23 years are Olympians Dax Holdren and Brook Billings, and current world beach champion Todd Rogers, who is on the verge of clinching a berth in the 2008 Olympics with partner Phil Dalhausser. They will be seeded No. 1 in the AVP Huntington Beach Open this weekend. • Track & Field: One of the finest all-around athletes in these parts is San Marcos senior Lyndsay Pearson, the Santa Barbara County champion in three individual events, the 100- and 300-meter hurdles and the triple jump. 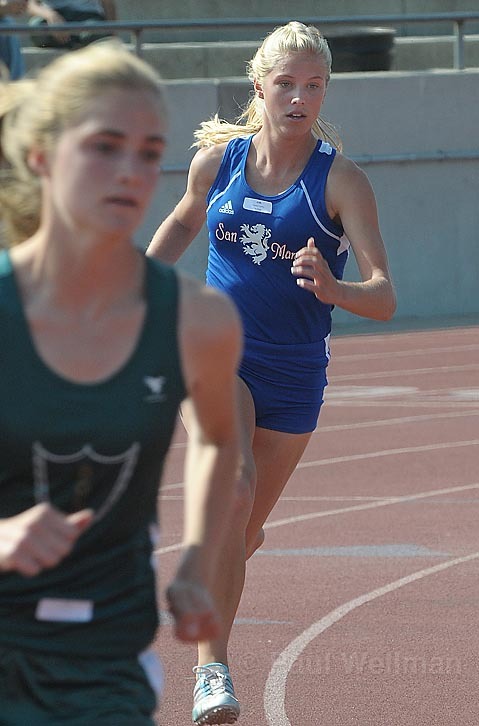 She will compete in those, as well as the 4400 relay, in the Channel League Finals this afternoon at Dos Pueblos High. Pearson hopes to reach the state finals in the 300 hurdles for the third time. She got there as a 9th grader and again last year, when she finished sixth. Then it will be on to the University of Oregon, where Pearson will be coached by former Olympic heptathlete Kelly Blair LaBounty. • The Iceman Cometh: San Marcos will celebrate its rich athletic legacy with a Hall of Fame dinner Saturday night at the Page Center. Among the inductees are football player and wrestler Chuck Liddell, who has become a huge celebrity as “The Iceman” of Ultimate Fighting fame; the 1998 boys CIF championship soccer team; and Det Hardy, who in 1995-96 had a monumental year as an MVP athlete in football, soccer, and baseball. BASEBALL GAMES OF THE WEEK: UCSB’s dramatic 5-3 win over Cal Poly last Sunday-Brian Gump‘s two-out, ninth-inning grand slam was the crowning blow-set up a showdown series at Caesar Uyesaka Stadium between Big West leader Cal State Fullerton (11-4) and the Gauchos (8-4). Game times are 2 p.m. Friday and 1 p.m. Saturday and Sunday. : In a marquee high school matchup, Dos Pueblos visits Santa Barbara at 3:15 p.m. on Friday. HIGH-STRUNG: The Gaucho men’s tennis team won its third consecutive Big West championship under Coach Marty Davis. ROAD TRIP OF THE YEAR: The Santa Barbara Foresters semipro baseball team has been invited to Havana to play the Cuban national team in a three-game series, June 20-22. College women’s tennis Community College Regionals at Pershing Park and Municipal Courts, 9 a.m.
High school swimming Channel League Finals (diving) at Dos Pueblos, 2 p.m.
High school track & field Channel League Finals at Dos Pueblos, 3 p.m.; Tri-Valley League Finals at Carpinteria, 3 p.m.
High school softball Malibu at Bishop Diego, 3:30 p.m.
High school volleyball Nordhoff at Carpinteria, 6 p.m.; Buena at San Marcos, 6:30 p.m.
College baseball Cal State Fullerton at UCSB, 2 p.m.
High school swimming Channel League Finals at Dos Pueblos, 2 p.m.
High school baseball Dos Pueblos at Santa Barbara, 3:15 p.m.; Ventura at San Marcos, 3:15 p.m.; Santa Clara at Bishop Diego, 3:30 p.m.; Grace Brethren at Carpinteria, 3:30 p.m.
High school volleyball Mission Prep at Carpinteria, 6 p.m.
Run-walk Mother’s Day 5K/10K, Goleta Beach County Park, 8:15 a.m.
College softball Pacific at UCSB (2), 12 p.m.
College baseball Cal State Fullerton at UCSB, 1 p.m.
College women’s tennis Community College Regional Finals at Pershing Park, 1 p.m.
Basketball Ventura Jets at Santa Barbara Breakers, SBCC Sports Pavilion, 7:05 p.m.
College softball Pacific at UCSB, 12 p.m.
Santa Barbara Athletic Round Table press luncheon, Harry’s Plaza Cafe, noon. High school baseball Buena at San Marcos, 3:15 p.m.; Grace Brethren at Bishop Diego, 3:30 p.m.
High school softball Ventura at Dos Pueblos, 3:30 p.m.; Bishop Diego at Carpinteria, 3:30 p.m.
College baseball UCSB at Pepperdine, 3 p.m.
Run-walk-swim Night Moves at Leadbetter Beach, 6:25 p.m.
High school baseball Ventura at Dos Pueblos, 3:15 p.m.’ Cabrillo at Carpinteria, 4 p.m.
High school softball Buena at San Marcos, 3:30 p.m.
College baseball UCSB at Long Beach State, 7 p.m.
High school swimming CIF Finals at Long Beach Belmont Plaza, 6 p.m.
Basketball Hollywood Shooting Stars at Santa Barbara Breakers, SBCC Sports Pavilion, 7:05 p.m.
High school track & field CIF Division 4 prelims at Carpinteria High, 12 p.m.
College tennis NCAA tournament: UCSB vs. Stanford at Pepperdine, 2 p.m.
College baseball UCSB at Long Beach State, 6 p.m.
Basketball Pasadena Slam at Santa Barbara Breakers, SBCC Sports Pavilion, 7:05 p.m.
College baseball UCSB at Long Beach State, 1 p.m.